In a large stockpot, saute onions and celery in oil or margarine 4-6 minutes over medium-high heat. Add potatoes and just enough water to cover potatoes. Add bouillon and seasonings. Turn heat to high. Boil potatoes for 10-15 minutes. Add carrots and continue boiling 5-10 minutes. Drain excess liquid if necessary. Stir together app. 1/8 cup corn starch with 1/4-1/2 cup water, so the corn starch is completely dissolved and there are no lumps. Add to soup. 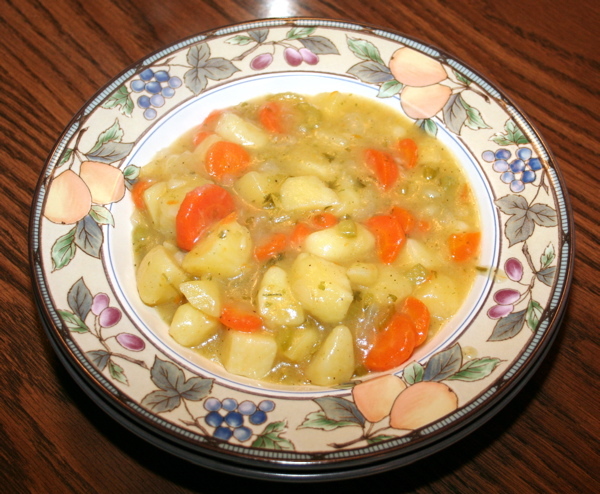 Continue cooking over medium heat until soup is desired thickness. To serve, ladle soup into bowls, sprinkle with a pinch of paprika and fresh ground black pepper. A slice of crusty bread goes great with this dish.